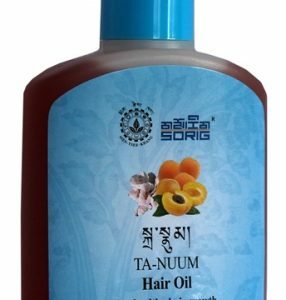 Tibetan Medicine explains that hair care, like skin care, involves not only external treatments but also proper care of our diet, lifestyle and environment. It is equally important for the health of our hair as well as body and skin that we eat healthy food, rest and relax and keep a positive mental attitude. It is a holistic system of medicine, taking into consideration the relationship between the mind, body, spirit and the environment – balancing the three main body energies which form the basis of a healthy mind and body, and the five cosmic energies that surround us in our external environment. According to Tibetan medical philosophy the body energies need to flow freely to create a longer, healthier life, and to promote an overall sense of calmness and well-being. Sorig Herbal Hair Care products are based on that philosophy. It is the imbalance of Loong, Tripa and Baekan (wind, bile and phlegm humours) that manifest themselves in stress and stress-related hair problems like premature greying and hair loss.